An illustrated talk by our own Dr Robin Wootton whose primary research field was in insect flight mechanics and who has regaled us in the past in his own inimitable style. 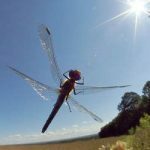 He will use slides, models and video sequences to explore the diversity of damselfly and dragonfly flight techniques and behaviour, and will discuss how these are reflected in the variety of their wing and body designs. All are welcome. Ample free parking behind Crediton church. DA members £2, non-members £3.